HitchSki is a ski and snowboard carrier that clamps onto your Yakima dual-arm, hitch mounted bike rack. The carrier holds up to six pairs of skis or four snowboards, features adjustable arms and protects your gear with rubber padding and SKS locks. Lowest Prices for the best ski and snowboard racks from Yakima. Yakima HitchSki Snowboard and Ski Carrier for Hitch Mounted Bike Racks part number Y02418 can be ordered online at etrailer.com or call 800-298-8924 for expert service. HitchSki is a ski and snowboard carrier that clamps onto your Yakima dual-arm, hitch mounted bike rack. The carrier holds up to six pairs of skis or four snowboards, features adjustable arms and protects your gear with rubber padding and SKS locks. This versatile winter sport carrier lets you carry 4 pairs of skis or 2 snowboards safely and securely on your roof rack. The carrier includes universal mounting hardware, soft rubber padding to protect your gear, and locks that help deter theft. This low profile carrier transports up to 6 pairs of skis or 4 snowboards. Vertical spring system accommodates thick snowboards, and raisers protect your roof from skis with tall bindings. Includes universal mounting hardware and integrated locks. 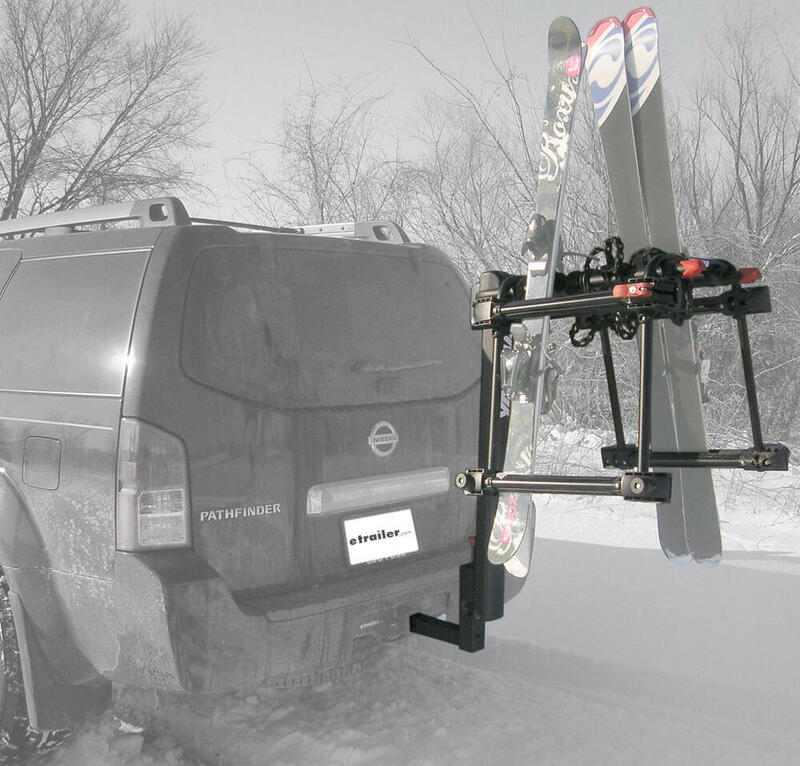 Transport skis and snowboards safely and securely on your hitch-mounted bike carrier with this adapter. The Tram secures to your bike rack's existing cradles and straps. And the cushioned, hinged arms of the adapter include One-Key locks. Today we are going to show you part number Y02418 from Yakima. This is their Hitch Ski Mount. 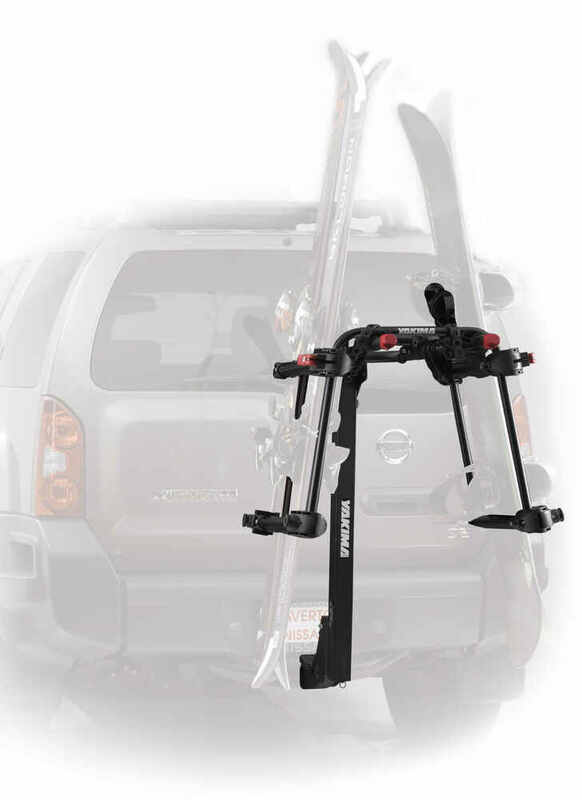 What this does is, it adds ski and snowboard capacity to your hitch-mounted bicycle rack. It comes with adjustable lower arms that grab everything from thin snowboards to thick skis. It also comes with a little bit longer arms than normal for todays extra-wide skis, and it easily attaches to your existing Yakima hitch mount, except for the KingPin 2, and most other hitch racks. 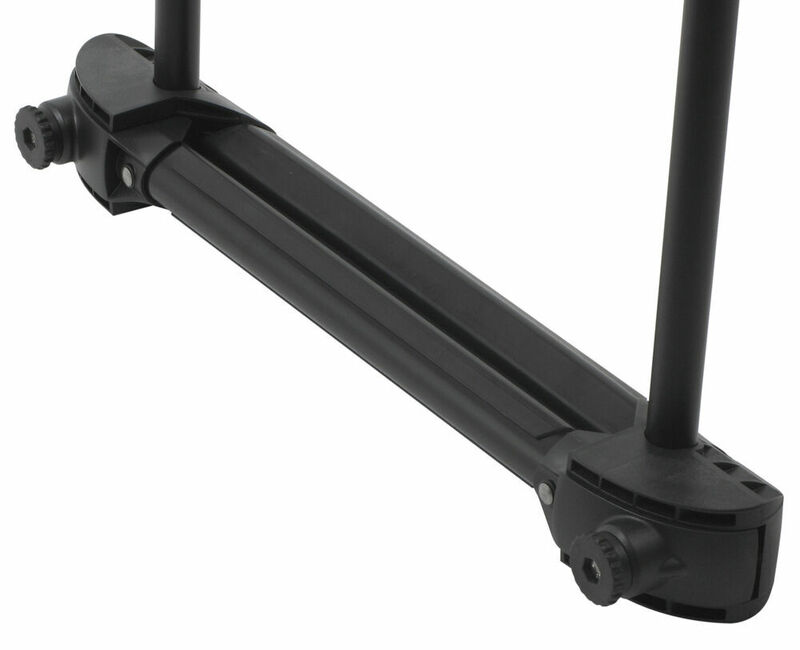 This product easily attaches to your existing Yakima hitch rack, including most other hitch racks, except for the two-bike DoubleDown. We are actually going to install this on a DoubleDown 5. We will give you a better idea of how it works and we will load it up with some skis. All right, we will go ahead and install this on our rack here. It installs just like a bicycle would on your rack here. Let us go ahead and just do it. Put it on the cradles and just strap it down into place. First, you want to loosen up the bottom clamp. Just undo the screws until they stop. Use your room to slide your skis into, because this does not come off. Then, undo your top clamp here. And again, just slide your skis in there and then clamp it shut. Get them into position the way you want them to and then just go ahead and pull your top clamp into place and lock it down. You may have to tighten it up just a little bit, and cinch it down into place. And you also have a key lock here to make sure they do not go anywhere. Once you have that done, then go ahead and clamp down the bottom clamp. And there you have it for part number Y02418 from Yakima, the Hitch Ski Mount. 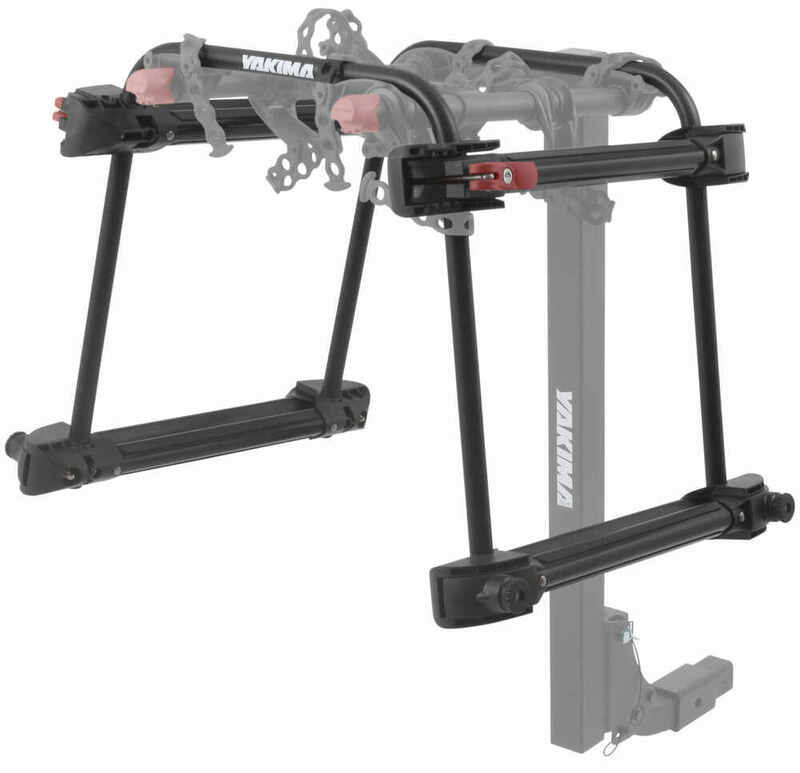 Order: RelevanceNewestRating - High to LowRating - Low to High HitchSki is a ski and snowboard carrier that clamps onto your Yakima dual-arm, hitch mounted bike rack. The carrier holds up to six pairs of skis or four snowboards, features adjustable arms and protects your gear with rubber padding and SKS locks. Works great. Gets easier to install skis after use a few times. The rubber is pretty firm. This combined with a new Thule swingarm style hitch mount carrier makes ski loading, carrying, and security a breeze. It’s fine. I have only used it twice. A suggestion would be to make the part that goes into the hitch receiver longer by 4 inches. Without it the back door of the Jeep Wrangler will not open fully. The spare tire hits. I bought a hitch extender and that did the trick. If your rack was longer the receiver would not be needed. Till owned it and very happy with the product makes our trips easy skiing and happy also to had found it by you guys. Do you have a question about this Ski and Snowboard Rack? 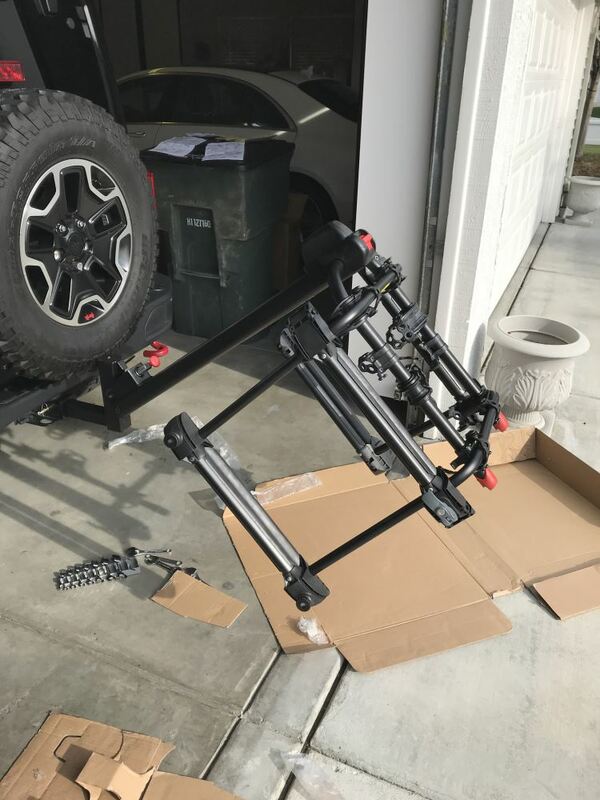 For a hitch mounted ski and bike rack combo the best place to start is with an adapter like the Yakima HitchSki part # Y02418 that you referenced. 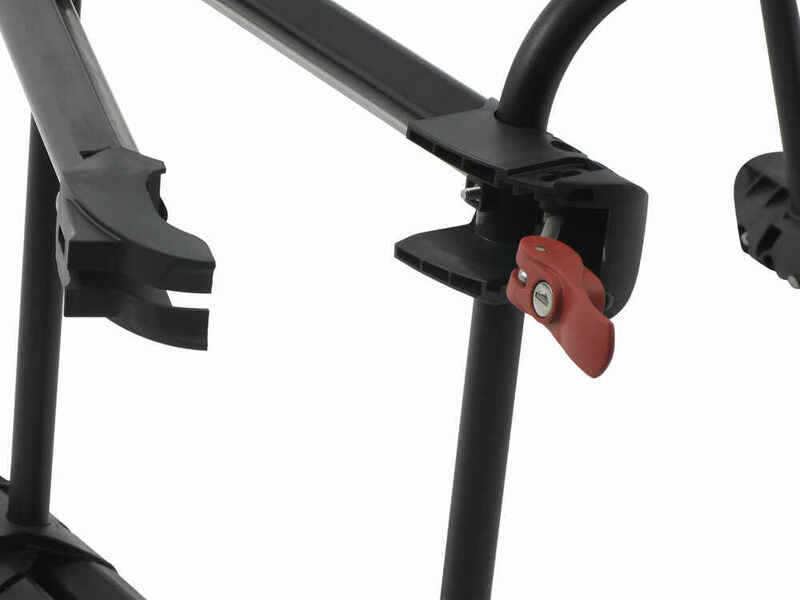 This is a ski rack adapter for hanging bike racks. Next you would need a bike rack to use with this adapter. 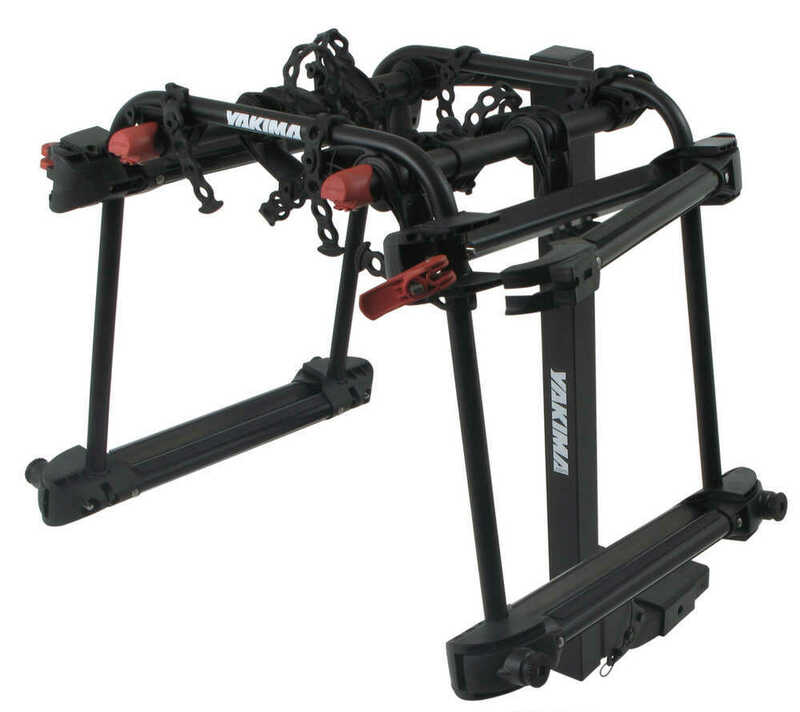 For that we have the Yakima FullTilt part # Y02462 for a tilting 4 bike rack. 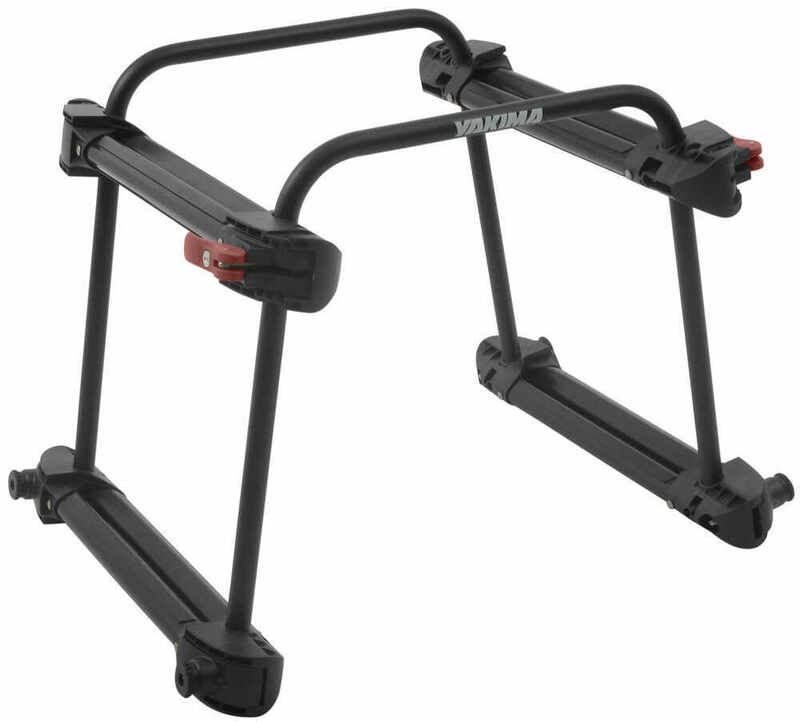 Or for a more budget friendly bike rack we have the Yakima DoubleDown part # Y02424. If you already have a Thule or Yakima hitch bike rack that is compatible with the Thule Tram Ski Rack # TH9033 or the Yakima Ski Racks # Y02418, you could use either of these carriers. The compatible bike racks are listed on the product pages. 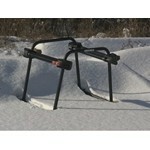 I have linked all the hitch ski and snowboard racks we have available. The Yakima HitchSki, # Y02418, snowboard and ski carrier for hitch mounted bike racks that you referenced is designed to work on a two arm, 4 bike, hitch mounted bike rack that has Anti-Sway cradles and straight arms. If your Schwinn 4 bike rack has similar anti-sway cradles, straight arms that are no more than 24 inches wide and cradles that are adjustable on the arms, you should have no problems using the Hitch Ski Carrier on your bike rack. 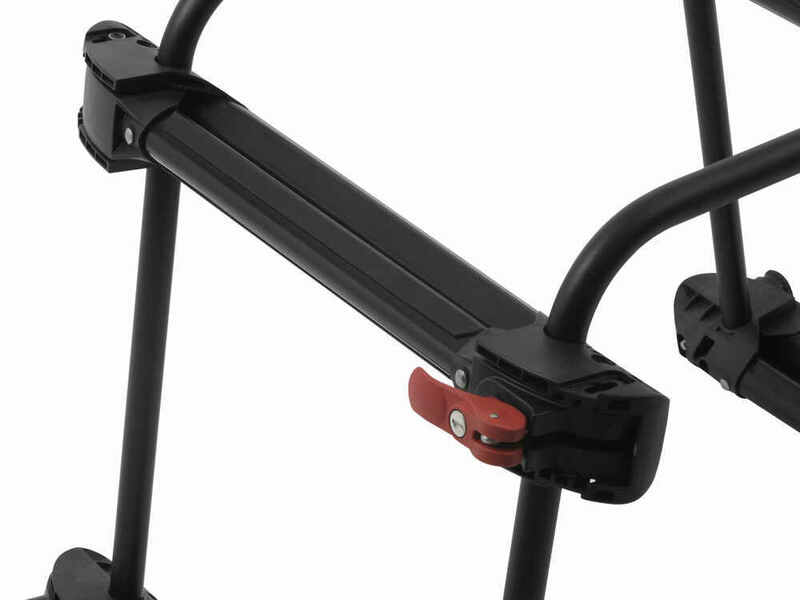 I spoke with one of our contacts at Yakima, who assured me that their HitchSki, part # Y02418 is indeed compatible with the older single-arm SwingDaddy bike rack. For install details and a product demonstration video, click the provided link. Thule has a carrier that will fit your TH912XT bike rack. Take a look at the adapter # TH9033. This carrier is designed to fit certain Thule bike racks, including yours, and it holds 6 pairs of skis or 4 snow boards. I have included a link to a video review for you. The Yakima HitchSki # Y02418 is designed for use with certain Yakima racks and would not be the best fit on a Thule rack. However the space between the 2 bars that fit around the arms of the bike rack is 24 inches. The Yakima HitchSki Snowboard and Ski Carrier # Y02418 is 24-inches deep so it is too large to fit on a Swagman Original bike carrier. This ski carrier and the similar Thule Tram # TH9033 are intended for use on the two companies' 4- and 5-bike carriers whose arms are long enough to mate properly with these ski carriers, such as the Yakima DoubleDown # Y02424. If you care to let me know the year/make/model/version of your vehicle I will be glad to recommend a roof-mount ski carrier for you. 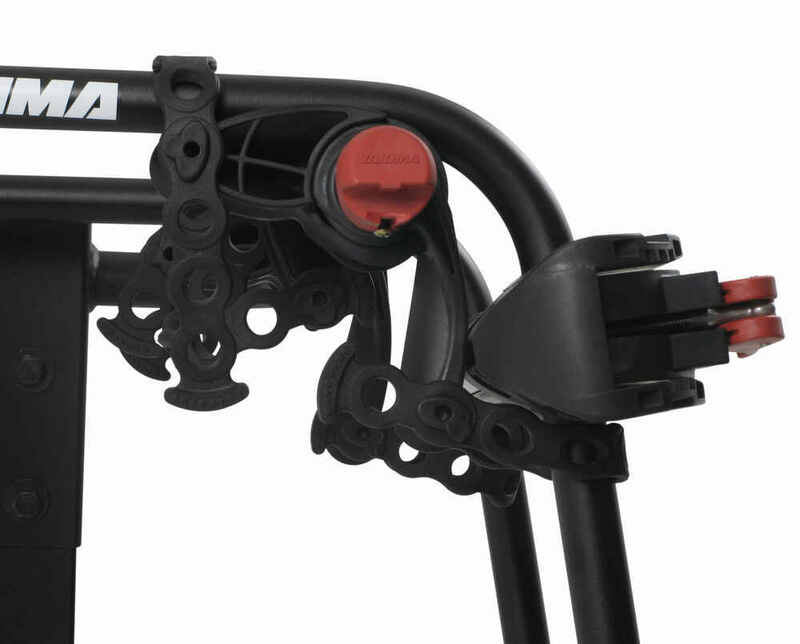 The Yakima HitchSki, part # Y02418 is designed to work best with the straight arm Yakima carriers. Its two central bars are about 24 inches apart, and being straight may not sit correctly on the raised curve of the Thule racks. Thule does make the Tram, part # TH9033 that is designed to be compatible with most Thule four bike racks, and will have a much better fit for your rack. Highest quality ski and snowboard racks for the best price. Most detailed, accurate ski and snowboard rack information available.